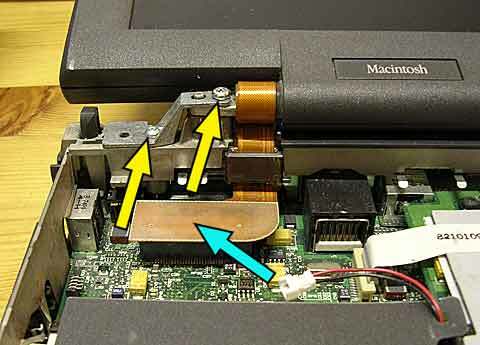 How to fix the powersource's connector of a Powerbook G3 (Kanga), by soldering. As usual I'm not responsible of what you do to your computer by following my advices. The PB wasn't charging the battery anymore. Neither with the original charger or with another one. The owner had to fight with the connector to get some juice from it. 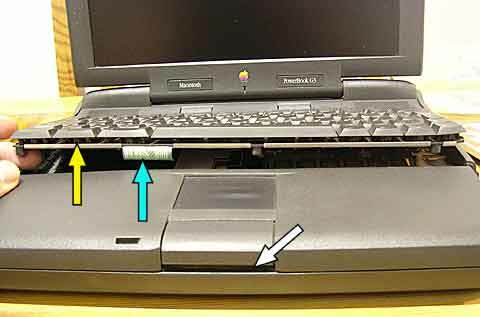 As usual, first you turn off the beast, then you unplug the powersource, the battery and the optical drives (a CD player here). 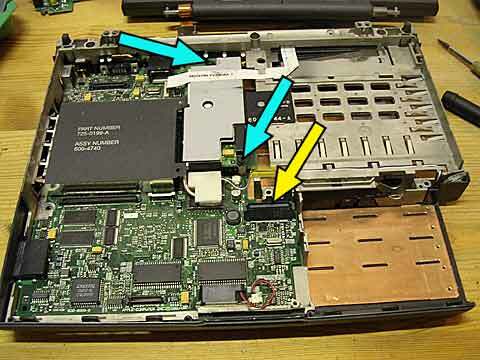 Turn the PB face down to unscrew 3 torxes 8. 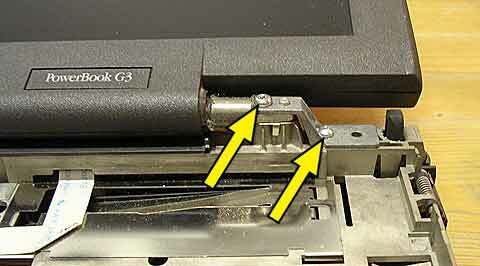 Once you've unscrewed the torxes, the keyboard is no longer secured. You can now lift lightly from front . You have to be carefull not to rip appart the flat connector . 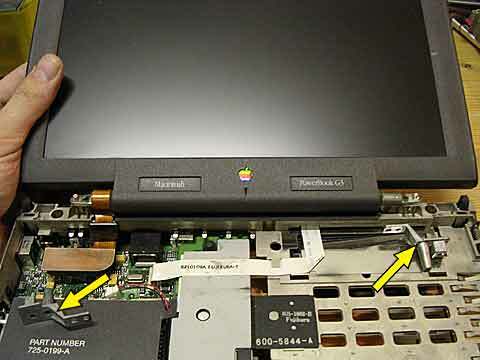 Under the trackpad, a big space , witch must be the biggest defect at Apple since it lasted from the Powerbook 190 up to the Powerbook G3. I'll talk about that in another article (only in french now). ... to disengage the wedge just under the speakers. Lift lightly the connectors wedges (from 1 to 2 mm) and then unplug the flat connectors . 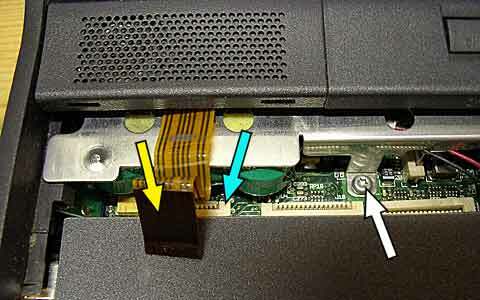 You can unplug the memory card, fastened by its connector on the motherboard . All the screws are different (color, threat, lenght) -> you'll hardly make a mistake here. We swing the "dock" toward us and we can now unplug the backup battery connector. 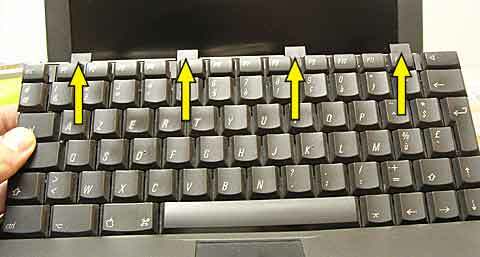 To take off the screen, you'll have to disengage the two lateral panels. You open the screen widely . Use your fingers or a mini lever. Unclip both covers by pulling up . 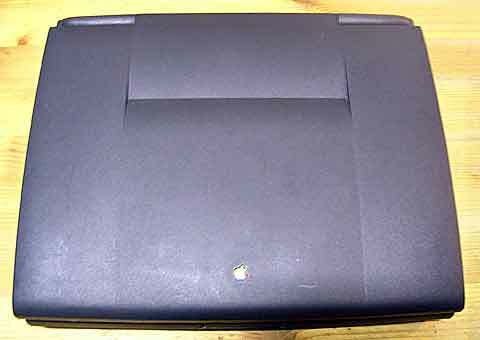 Once you have removed the right cover, you can see the screws that hold the screen's right hinge in place. 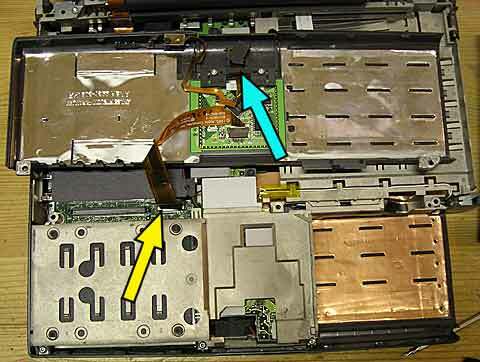 On the left side, we now start to gain access to the power supply connector . you can see that the middle connector is loose. Some other parts are bouncing around, too . This one is not right too. 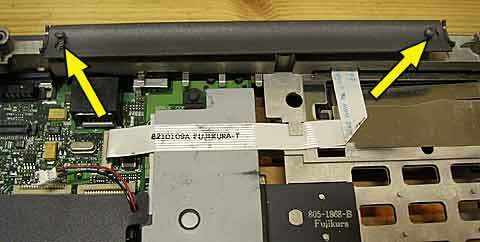 This panel holds both of the ejection switch for PCMCIA cards . 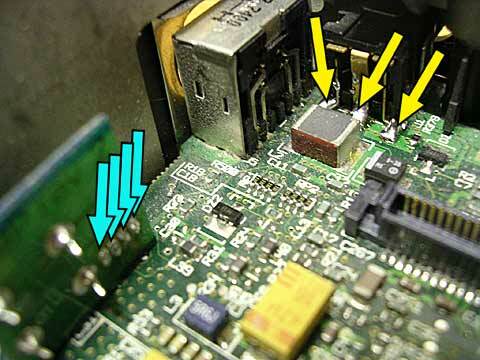 It should be soldered here . To allow us to work with comfort, we will need to remove the handrest. It is clipped 6 times . 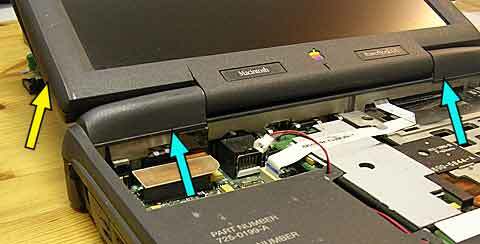 After unclipping, we flip it gently on the powerbook. We now unplug the flat connector . 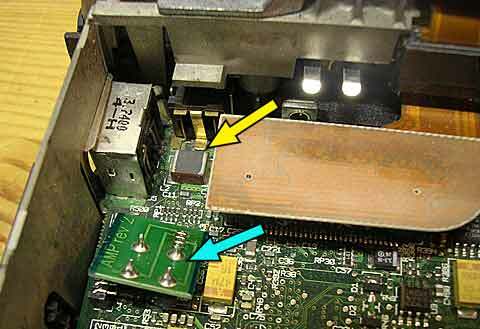 Pay attention to the ferrite. It tends to wander around. 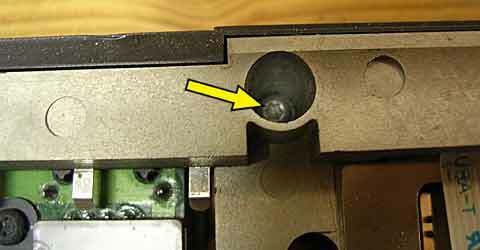 You can now see clearly that the trackpad's button is broken . See my previous comment about it. 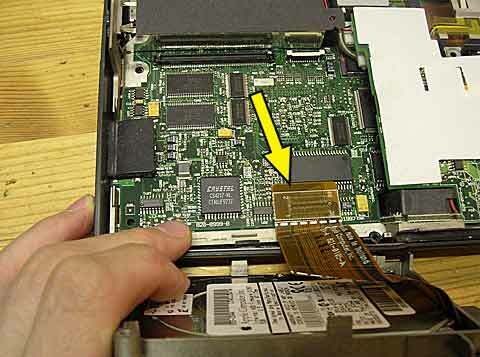 3 torx screws to undo and you can now free the hard drive. Pay attention to the flat connector, again. Flip it gently toward you. We now unplug the connector . After the video connector has been unplugged, unscrew both screws from the left hinge. Don't forget to hold the screen. Two more torx 8 remain to the right. Here are the two items that hold the hinges . 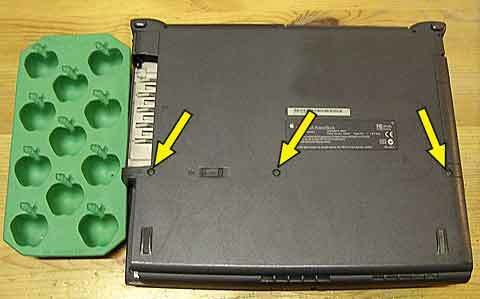 They are very different -> no worries, you won't switch them by mistake when putting everything back in place. You can now lift the screen and put it in a secure place. 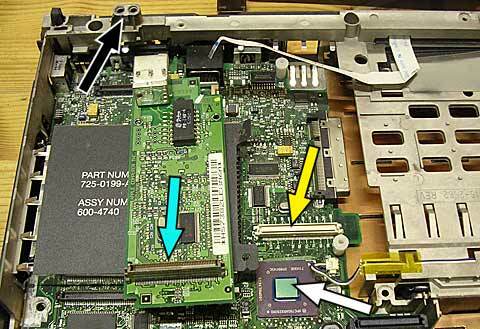 If you want to remove the whole motherboard, unscrew everything here . 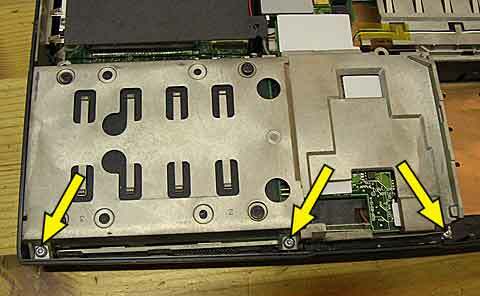 It gives you access to those hidden screws (nothing to do with trackpad's problem ;-)). I choose to simply make some room. Unplug the power supply board, by lifting up. 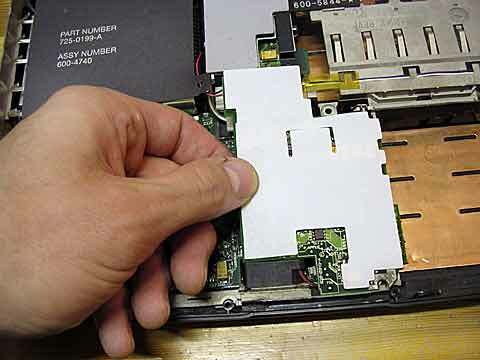 At its end, you'll have to unplug the battery connector by taking it off from its guides. 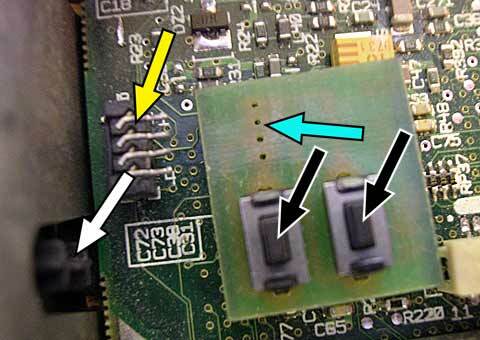 The power supply board was connected here . 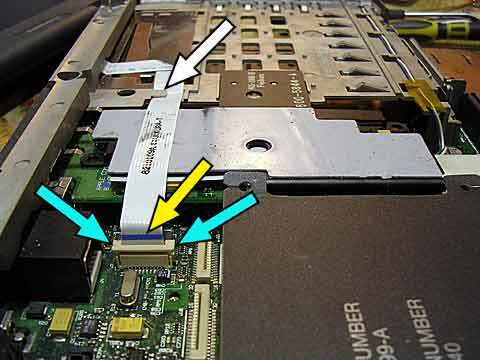 Now, you can undo the two screws that holds the G3 heatsink. 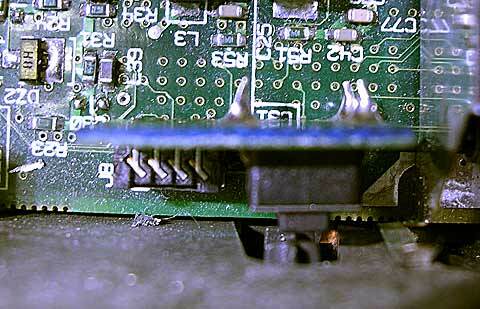 Yet another flat connector to unplug . The plastic parts to lift (1 or 2 mm) . 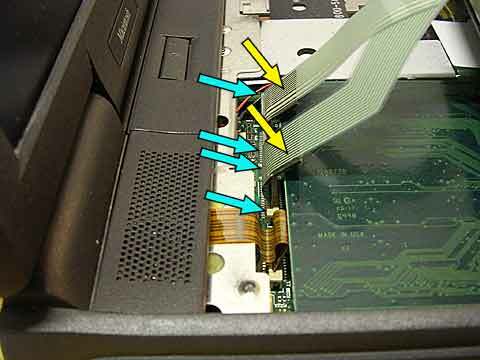 You'll have to withdrew the flat connector from this guide too. 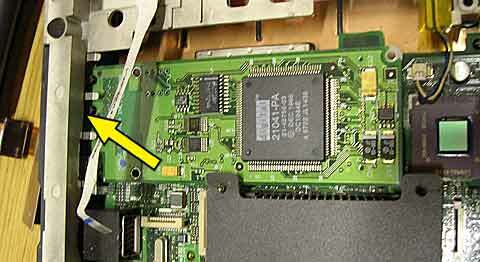 You can now lift the ethernet (or modem) card. 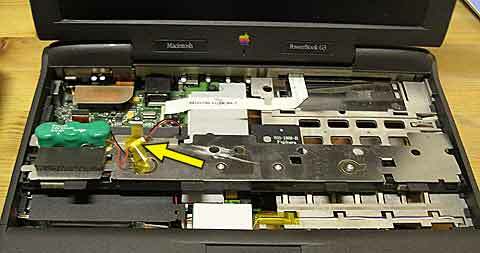 Pay attention to do it toward the inside, since it is under the edge of the powerbook . 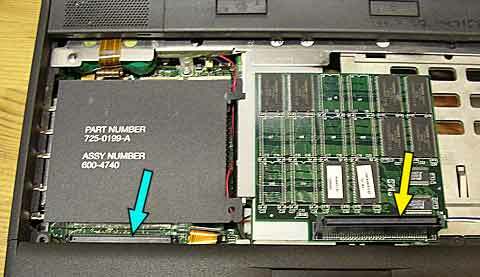 The connector, from the ethernet card side and from the motherboard card side . The CPU and a metallic piece . It can be removed, but only if you really want to ask yourself where it belongs when rebuilding the computer. There's one on both hinges support. The area is clear, we can now solder back. The 4 pins go in the 4 holes . The switches have to be in front of the pushing buttons . 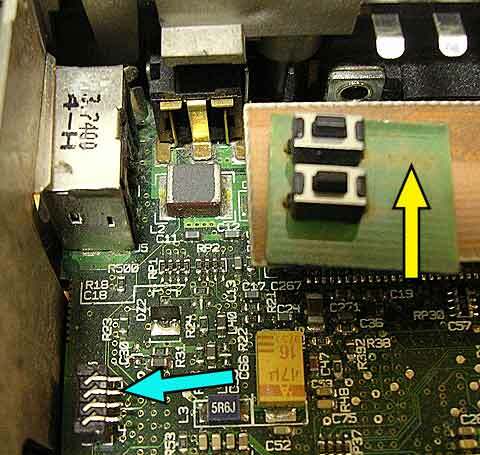 The part with the pins is plugged on the motherboard. I just leave it there, and use it as a support. The beast has found back its place. 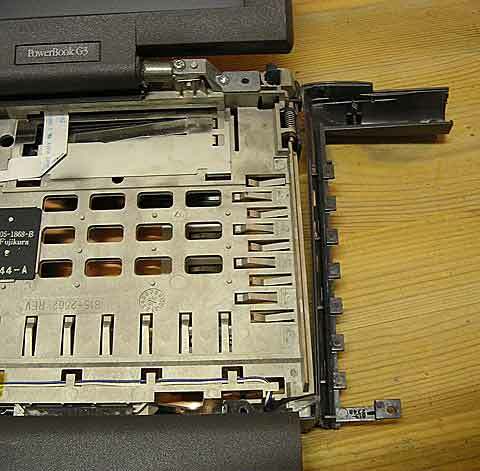 The 4 weldings , used to eject the PCMCIA cards. And the 3 weldings that hold in place the power connector. As usual, to reassemble, just do the same but in backward order.